I am terrible at lining eyes. With my shaky hands and unsteady strokes, I make mistakes all the time when trying to draw and line my eyes. Adding to my woes, I have a small eye crease space so I steer clear of thick eye lining techniques as it can unintentionally give me the goth look. And if that isn't bad enough, my oily eye lids mean no eye makeup stay on for long without massive effort and copious amounts of priming and prepping the skin beforehand so understandably I often forgo lining the eyes to avoid smudges during the day. Pencil liners are great for blending out to create the smokey eye look but tend to only give sharp fine lines from freshly sharpened pencil so liquid or gel liners are more dependable for clean sharp lines. Having narrowed down my choice of liners, I only have the product staying power to contend with when looking for eyeliners. Today I'm sharing with you two products that meets these demanding needs. I came across this brand when I was visiting an Asian beauty boutique in Box Hill, an eastern suburb of Melbourne a few months ago. The sales assistant swore by this product so I decided I must try it myself to see if it meets the needs of my very fussy eyes. This Japanese brand is one of the most popular drugstore brand in the Asian market and I can see why as the quality rival those of luxury brands. Pen type packaging - it reminds me of a good sharpie felt tip pen. It boast a fine 0.1mm tapered felt tip, giving you alot of control and is capable of drawing medium or very fine lines depending on the pressure and angle you apply it against your skin when drawing. 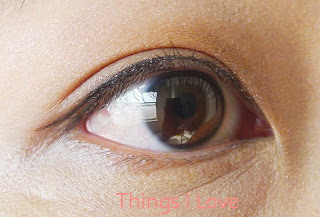 Beautiful rich black colour - just the deepest opaque black shade you want from your everyday eye liner and it only fades slightly after 8 hours. The ink flow beautifully out of this pencil and makes drawing lines effortless - it glides on smoothly with no bleeding on the sides and even improved my clumsy drawing skills and is practically idiot proof - I love it alone for making me look like I'm a pro with lining eyes meaning that I can now master drawing wings and flicks with the fine tips - see exhibit below for proof. It promises tear-proof, sweat-proof, oil-proof stay-put colour once dry and I'm happy to report that it delivers on all these promises. I don't get any smudging on it when lining the top lids and only the slightest smear after a good 3 hours when I do use it to tightlining work from my watery eyes (i.e line the water line or inner rims of the eye). If you don't have watery eyes, you will have no smudging problems with this product at all. Comes off fairly easily with eye makeup remover. Kate is mid range Japanese cosmetic brand from Kanebo who is reowned for his leading luxurious skincare products. I was introduced to this liner over a year ago by a girlfriend who had lived in Japan for over 3 years and is equally obsessive at finding the best beauty products. This is another pen type ultra fine liner with also with a 0.1mm felt tip (are you sensing a theme here?) so is great for any detail work you want to do on your eyes/face. Flicks at the end of eyes are also very easy to control with this pen liner. The ink flow of this liquid liner can be a bit finicky at times and needs going over your strokes a few times to even out the thickness of the lines and achieve good opacity sometimes but thankfully the fine lines means multiple layering doesn't add too much thickness and also helps to deepen the colour. The colour is a deep black shade but I find that by the end of the 10 hour day, it does fade to a dark grey shade so the formula is less superior to Kiss Me's . Is also non-bleeding, smudge-proof and tear-proof and stood up well against the majority of liquid liners out in the market. I find it again to not be as good in weathering my oily lids as Kiss Me's at the end a long day. It stood up well if you only need it to stay on your eyes for 5-6 hours. Comes of easily with eye makeup remover. I love both liquid liners and use them both interchangeably depending on how long I need to have my makeup on for. 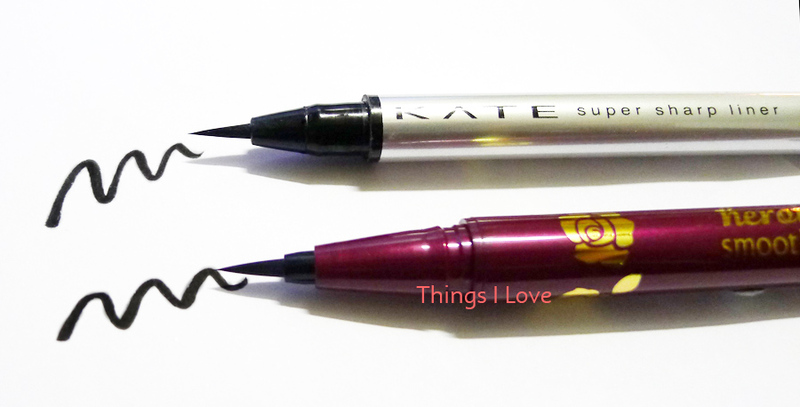 I find that the tip of the Kate eyeliner is less firm than the Kiss Me one, so can be slightly harder to use as I don't have a steady hand. For the working day, Kiss Me is the fail-safe option and for a night out, I'd happy draw away with Kate. 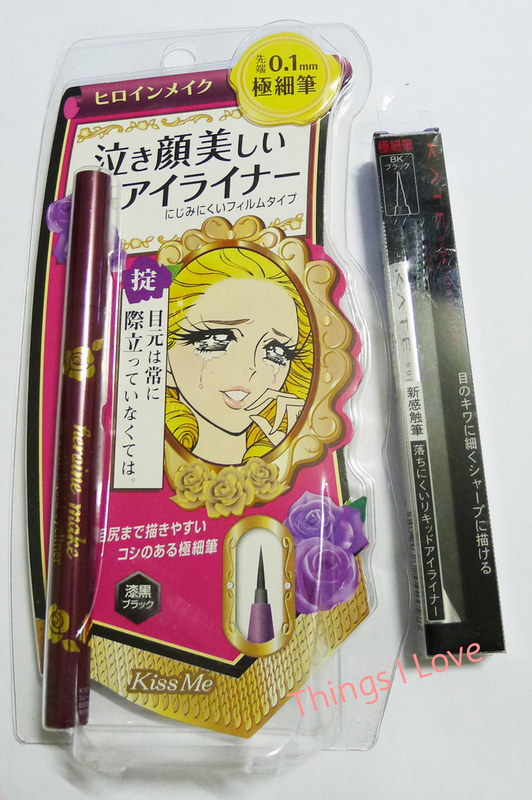 Is Kiss Me Heroine Makes' eye liner worthy of HG status? I think so as I've tried many liquid liners over the years and most fall short of the staying power or ease of application. It is now my benchmark liner when comparing all other liquid eye liners and at such an affordable option, I can't recommend this product enough.